Residents from the Sacramento region will converge on our State Capitol in Sacramento this Saturday April 29th at 11am for a climate rally and march in solidarity with gatherings centered in Washington DC with sister marches exploding worldwide. We come together to show the world and our leaders that people at the city level will lead in the joyful, life affirming work of transitioning to climate friendly lifestyles. The future of our communities teeters on the edge of climate catastrophe, and we refuse to stand idly by and watch. We know the future is in our hands. RSVP to ride your bike to the march. CLICK HERE! RSVP to lnittler@sbcglobal.net to ride Yolobus 42B to the rally. If we can fill the bus it will go directly to the march without stops. Indicate a 9:43 or 10:43a.m. departure. 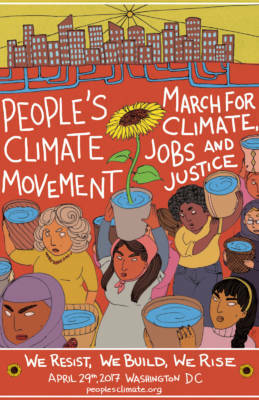 Organizers of the People’s Climate March cite the need for the march and action on climate change to call attention in particular to communities harmed by loss of livelihoods, increased pollution, extreme weather, drought, and famine. Bill Heinicke and Margie Mansell, Lindsay Weston, John and Joe Johnston, Kathy, Todd, and Jaxon Kamisky (Jaxon as La Gotita the raindrop), Kristina Miller and friend Jasmine, Steve Tracy and grandson Orion, Lynne Nittler, Mark Tebbutt, Chris Granger, Leslie Crenna, and Maria Contreras-Tebbutt are all smiles marching for climate at Picnic Day 2017. Photo credit: Yvonne Hunter. The march organizers are working in collaboration with the organizers of the Women’s March this past January. The Sacramento Women’s March evoked uplifting energy, a profusion of hopeful signs, camaraderie, kindness, thoughtfulness, and wonder that so many people could come together from our own community in common cause. Speakers at the march will include Jessa Rae Growing Thunder, Dyane Osario of Sierra Club, Rabbi Nancy Wechsler, Imam Kashif Ahmed, and others. At 1:30 pm marchers will encircle the Capitol park. Signs are encouraged, especially those witty and glorious home-made ones. Handles should be wood sticks only, not too wide or long. You can download march images at http://peoplesclimate.org. 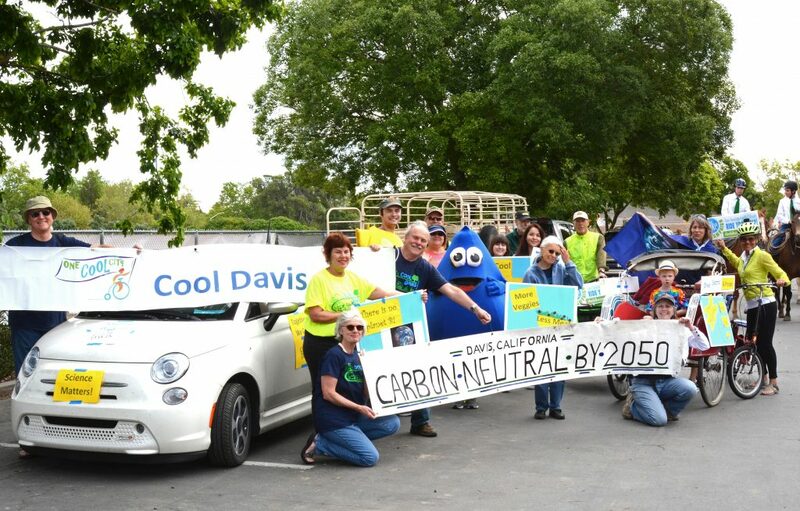 Matt Biers-Ariel regularly commutes from Davis to Winters, but on April 29 he’s thinking about biking to the capitol!Davis residents are challenged to get to the capitol without using fossil fuel! At the capital grounds, tables for environmental groups plus some art and activities for children will begin at 11:00am. The program on the East steps is from 11:00am to 1:30pm with a blend of music and short speeches focusing on climate solutions. All amplification is bicycle-powered and participants are invited to take a turn pedaling. At 1:30 marchers will encircle the capital grounds using the sidewalks. Once the circle is complete, we’ll engage in a joint Climate Pledge based upon our vision for a climate friendly future. Video cameras and photo documentation throughout the day are encouraged. 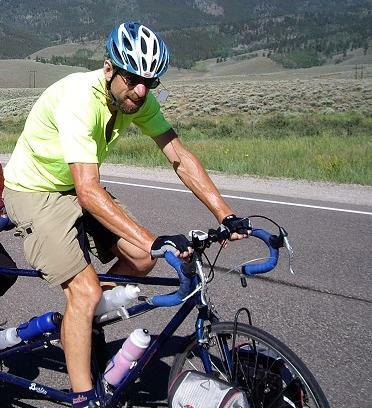 The family-friendly bike parade will meet at 9 am at the Mace Blvd. Park and Ride stop by the entrance to I-80, and will make its way to join a climate rally on the East steps of the Capitol East at 11 am followed by a march around the capitol at 1:30 pm. For those who need a lift, Yolobus has been alerted that many folks will be heading across the causeway that day. For the Women’s March many folks left cars in Davis and rode Yolobus. This relieves any parking issues and provides a care-free experience with a smaller carbon footprint per person! Take any of the regularly scheduled bus routes, using the information here. 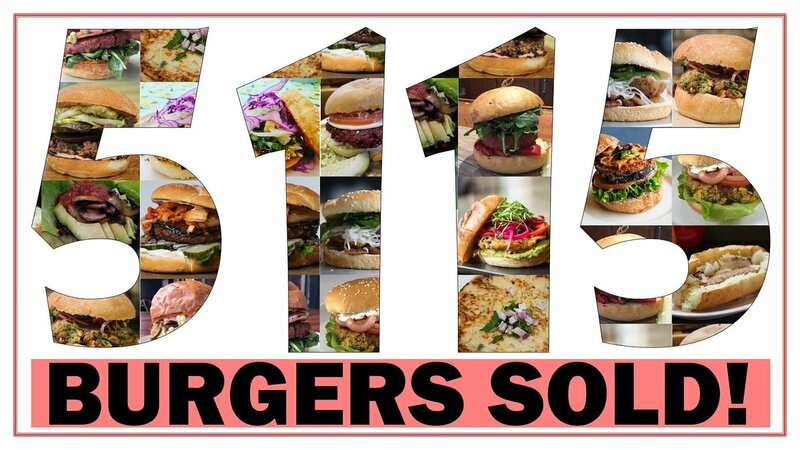 Best routes will be 42B to Sacramento and 42A back to Davis. For those who bike in, Yolo Bus can carry up to three bicycles per bus for tired bike riders at the end of the march. Read the details for bikes here. RSVP to lnittler@sbcglobal.net to ride Yolobus 42B to the rally. Indicate the 9:43 or 10:43a.m. departure. Park at the Mace Park and Ride near Ikeda’s, cross the street at the light and walk to the bus stop at Mace & 2nd by the church. Then relax and ride to the rally and back on Yolobus. One-way fare is $2.25 with exact change ($1.10 for seniors with a bus pass). Best to arrive early to get a seat! Return on Yolobus 42A on the half hour at 1:30, 2:30 p.m., 3:30 p.m., etc. Your RSVP helps Yolobus anticipate the number of buses for Saturday. If you choose the earlier bus, pack a snack and walk the Capitol grounds before the rally beings at 11 am. If you choose the later bus, the lead organizer has assured us that missing the first 20 minutes will be ok.
More updates will be posted as details are announced. 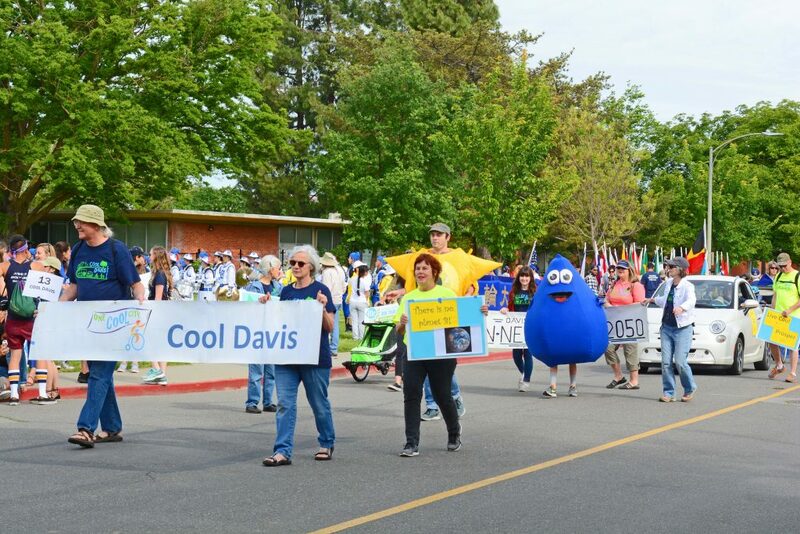 Cool Davis crew marches, rides, and rolls for climate on Picnic Day 2017. Photo credit: Yvonne Hunter. On the 100th day of the administration, thousands will take to the streets to send a clear message to our government: We demand responsible climate action. Dozens of sister marches are planned alongside the national Washington DC Climate March (see below) and the Sacramento Climate Coalition is excited to be leading local efforts for this important milestone. Sister marches worldwide. Sacramento is hosting a sister Climate March on April 29 on the east steps of the capitol. We, the people, are building a sustainable future by creating and promoting grassroots solutions to climate change. 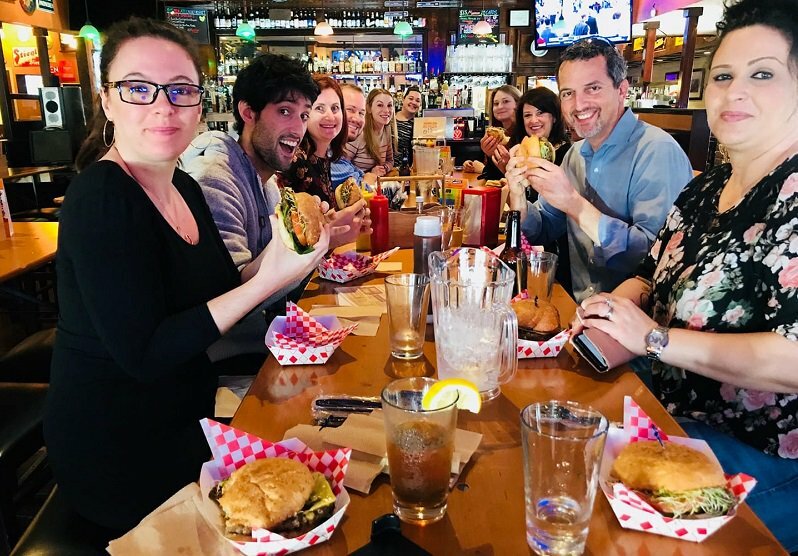 We envision a green economy that puts people and planet over profit and politics, protecting our world from fossil fuel destruction while ensuring that those who are disproportionately affected by climate change have a seat at the table. We demand that people be valued over corporations. We call on all city, state, and federal governments to immediately promote a social and economic mobilization to restore a climate that is safe, stable, and supports human civilization. Who is organizing the Sacramento march? 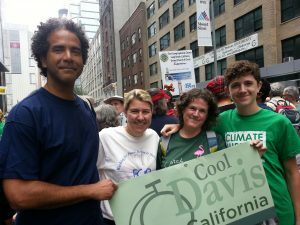 A grassroots alliance of Sacramento groups and individuals advancing the broader movement for civil rights, justice and our environment now and in these crucial years ahead has formed. When the climate changes, everyone everywhere is affected – the disadvantaged and the poor most of all. 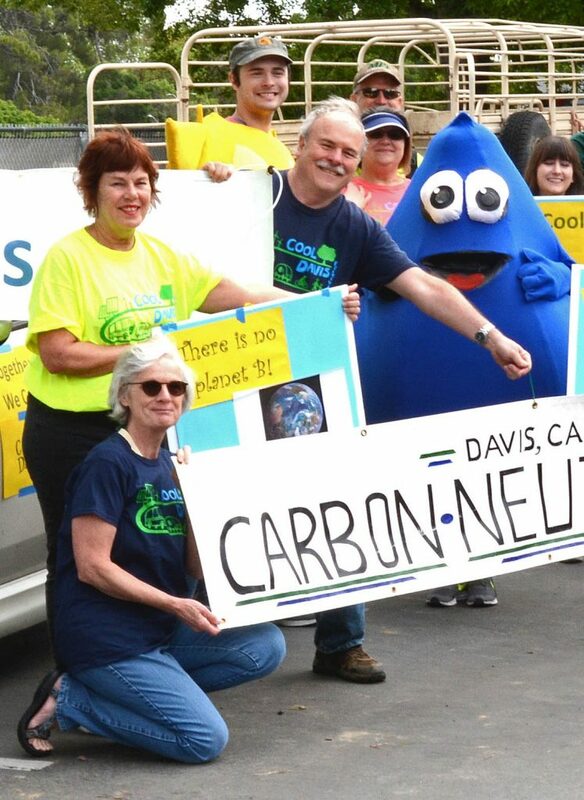 The Sacramento Coalition supports the rapid changes in our economy, power structure, and infrastructure necessary to stabilize greenhouse gases and forge healthy and vibrant communities. Poster for Climate March April 29, 2017. We will come together from across the United States to strengthen our movement. We will demonstrate our power and resistance at the gates of the White House. We will bring our solutions to the climate crisis and the problems that affect our communities to our leaders in Congress to demand action. The national Climate March website offers more history with photos, FAQ, resources including these cool posters, and media materials. With 100 days of action culminating in mass mobilization on April 29, the 100th day of the Trump presidency, this coalition will leverage their power once again to resist the Trump administration and corporate interests’ efforts to thwart or reverse progress towards a more just America. 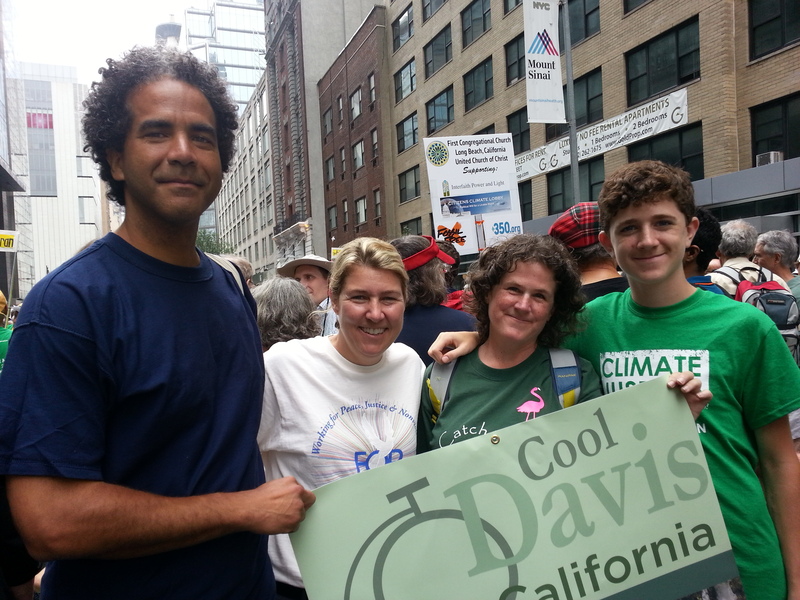 Kristin (Cool Davis volunteer) and Peter Heinemeier, and Kristin Stone and David represented Davis in the NYC Climate March Sept. 21, 2014. Courtesy photo. Background and History: The People’s Climate Movement grew out of the largest climate march in U.S. history in New York on September 21, 2014, creating a groundbreaking coalition of climate and environmental justice groups, labor unions, faith, students, indigenous peoples and civil rights groups working to build bold solutions to tackle the climate crisis, rooted in economic and racial justice.